By adopting chatbots, businesses can increase efficiency and cut costs while offering their customers a more personalised experience. In the infancy of the internet, AOL Instant Messenger was a state of the art means of communication, used as an early social platform and helping office-workers get faster responses from colleagues. The Bad and the Good! Millions of people already use platforms like Facebook Messenger and conventional text messaging every day - but chatbot technology is set to take the message format to the next level. Admittedly, chatbots have not been without their problems. While being the world’s largest software firm, Microsoft’s first steps into using this technology were halted due to racist remarks generated by its chatbot, ‘Tay’. What started out as something innocent and helpful, turned into something rather more sinister when the chatbot started posting inflammatory and offensive tweets, as a result of gathering offensive comments that had been posted online. Thankfully, that’s not the case for the many chatbots that are making a positive impact on people’s lives. In fact, Chatbots Magazine have stated that 2018 is the ‘year of the chatbot’, owing to huge advances and investment in chatbot technology by major firms. A great example is the Lark chatbot, which is already saving lives and improving health as a piece of technology that assists people who live with chronic diseases, and it has gathered a great reputation by doing so. By checking people have been eating the right food, or have taken their medication at the right time, support is offered by giving feedback which is comparable to having a nurse on hand - at a fraction of the cost, and with less intrusion. This is just one example of the importance that chatbots can and will have in our lives, and rather than being novelty items, they are extremely useful tools. Reducing unnecessary staff is an example of saving time and effort through a chatbot, but it also saves money for organisations by reducing wage bills and avoiding many costly mistakes that can occur through human error. As well as these benefits, it is easier to monitor expenditure in terms of payroll access and expense processing, both of which can be made faster by giving and receiving employee feedback, to ensure all parties agree over monetary amounts. Expense claims can be a bugbear for many employees who want them processed as quickly as possible, but face delays due to archaic processing methods and outdated technology. Consider this scenario. A sales person has to stay away from home for two nights to meet with customers. They keep all their receipts in a safe place for when they get back to the office to make an expense claim. They fill in an expense form and post the receipts to the payroll or expenses department. There is then a long wait for the expenses to be approved and the money paid. It’s a frustrating process for the employee, particularly if they are left struggling because they’re out of pocket. Had they used a chatbot, it would have read the image, turned the text from the paper into digital text and automatically sent the info to their expenses software for manager approval; with a response back in minutes. They could also check and confirm the amount, saving precious time, without having to keep mounds of paperwork! Chatbots work for a diverse mix of businesses, including makeup retailer and online brand Sephora. A historic brand, Sephora has moved from its origins on the Parisian high street, to using an innovative chatbot through Facebook Messenger, adding value for its customers. Already offering ‘virtual makeovers’ online through an augmented reality app which uses customer photos to show how products would look, the company are a good example of how technology can keep your business fresh. Their chatbot is used by customers to reserve appointments, currently for their US stores only, but with a far-reaching application for all businesses worldwide, and in every sector. By implementing scheduling software of this type, employees can manage themselves, arrange meetings and meet with customers – but the real benefit is that they can do all this whenever and wherever they are. 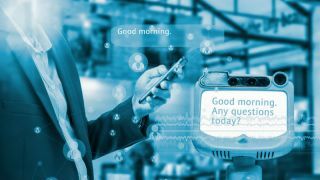 The mobile and intuitive nature of chatbots means that appointments can be easily arranged in environments where using technology is not usually practical, for example on a building site. By using the chatbot, a few pressed buttons can do all the work, and chatbots can memorise several common commands, such as ‘site survey’ or ‘boiler repair’ which are most frequently used, meaning mobile workers can organise themselves mid-job if required. Busy staff sometimes need a rest from the challenges the day throws at them and they, their managers and the HR department all have limited time and energy for carrying out administrative tasks. When a break is required, booking a holiday doesn’t need to be a challenge for anyone, as chatbots now have the functionality to do this in an instant. Imagine you are that staff member: After checking the dates and availability, your company chatbot can automatically send a message to one of your managers to authorise your annual leave, and the usefulness does not stop there. Once leave is authorised, it is now possible to book your actual holiday through a chatbot, selecting the best flights or using a questionnaire to establish the best kind of holiday for you. Many holiday companies like Kayak and Booking.com are already using chatbots to good effect, taking the hassle out of booking. The traditional airline British Airways took the bold step recently of using emojis to operate its messenger chatbot, after finding that more people prefer communicating by emoji than words. The so-called ‘Emojibot’ works by asking a chain of questions about the kind of holiday you are after, so a quick response can be made to speed up the search. This quick-fire rendition of a chatbot shows that as AI chatbots continue to develop, the time saved for businesses is going to be very significant, and bots a joy to use. The process of employees organising their schedule, booking annual leave, then booking a holiday for that break, shows that the multi-use nature of chatbots is hugely important for the future of business, and the present direction of technology; hugely benefiting businesses and their personnel management. Attendance is a challenge and high priority for many employers. By using a chatbot, staffing levels can be checked through a series of questions. Staff can also virtually check-in when they have arrived at work, training or customers’ premises. This makes it simple to see how many staff are working, and what staff are doing; for example who’s in or out of the office. From a practical standpoint, chatbots are a great thing. Saving money, time and (when programmed effectively) offering consistently useful help to both customers and employees. Having already been adopted successfully by many international companies, they do not seem to be going away. The chatbot can be a tool with a human voice, something more approachable than the software it drives – employees may find self-service procedures dull or complex for example, but by adding the illusion of a human assistant, the customer journey is far smoother, and the results will speak for themselves. Additionally, using a chatbot on a phone offers privacy to employees who wish to keep certain appointments confidential, such as a medical appointments or an application for a promotion - things they may not feel comfortable having displayed on their desktop monitor or work laptop for their colleagues to see, and comment on. When a new technology emerges, consumers and business leaders want to know the benefit of purchasing the product, and what it does. With an AI chatbot, the question is almost ‘what can’t it do?’ From organising, to engagement, to cost saving - a new era of technology has begun, and its possibilities are endless.